We like to have fun as you and your guests are there to celebrate, yet your DJ will not overshadow you as the main event of the evening. Also be assured your DJ will be dressed properly for the occasion. 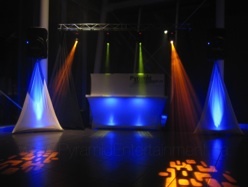 A very appropriate light show is included and if possible, everything is set up prior to your guests arrival. We visit with you before your wedding day to get to know you, more of your wedding plans, confirm the details of your reception, and make sure your special requests for the evening are met. 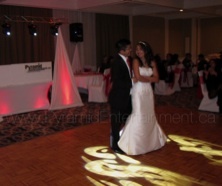 Our wedding dances start with the traditional first few dances for the Bride and Groom, Family and Bridal Party. We then invite everyone to join on the dance floor and begin the dancing by playing two to three selections each of various styles of music, from proven party songs, favourite classics to today’s current hits. This gives all your guests an enjoyable time to dance. At the same time, your DJ is carefully monitoring the dance floor, watching what music creates guest participation, then adjust music selections to perfectly match the audience. Requests are very welcome and encouraged. Our experience has taught us how to choriograph all this keeping the fun and dancing all night long. Cocktail Hour & Dinner Time. If you find your reception venue requires a sound system and microphone, or you would prefer custom cocktail hour/dinner music, these are available as an inclusive option that also includes the wedding party grand entrance with music and announcements. Larger light shows including a variety of intelligent lighting effects that project multi coloured patterns of light, greatly enhancing the dance floor experience. Video projectors for your slide show with connections to our sound system. Up-Lighting that elegantly transforms your venue with the colours of your wedding motif.